We encourage public school teachers and homeschooling groups to take advantage of our facility for teaching purposes. In efforts to increase outreach opportunities and become a more valuable resource to our community, we are creating complete lessons of various plant science topics to offer. 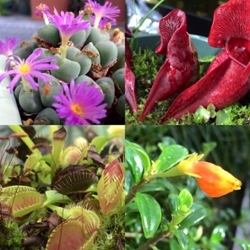 These lessons can either be given at the Williams Conservatory accompanied with a tour or will soon be accessible online for in-classroom use. Below are some of the completed topics for elementary age students. Tailored tours and lessons can also be created to meet individual class needs. Feel free to contact the greenhouse coordinator to schedule a tour/lesson or suggest any other topics of interest. 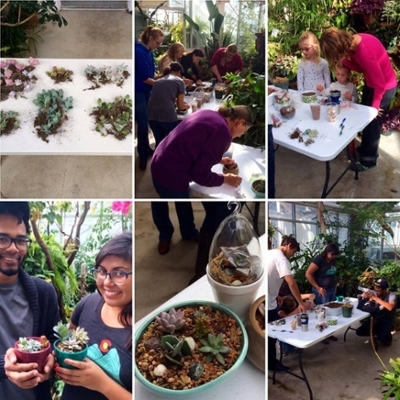 Attend our succulent workshops to learn about the newer fad of succulent gardens! For a small fee, we'll provide soil, 3 succulents, and decorative rocks for you to use to create your own succulent arrangement. All you need to bring is a small to medium sized container to create your garden in and a smiling face! You'll learn how to propagate your own succulent plants and troubleshoot any issues you may have with them. Look out for announcements of these workshops! You must sign-up for workshops as spots are limited. Browse through the Conservatory to learn about flower adaptations and unique pollinator – flower relationships. Learn about the economically and socially important plant species in the conservatory by referencing our plant information signs. Join us at our plants sales each winter and spring to learn about the plants in the Conservatory and how to care for them at home. 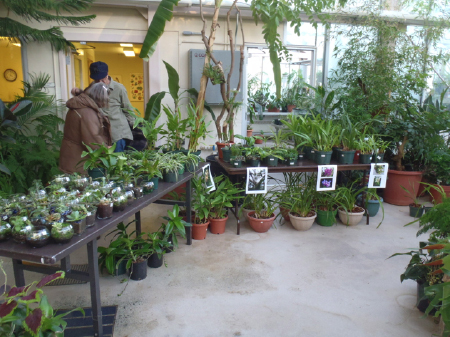 Plant sales are hosted in conjunction with the Botany & Biology Club. You can follow our Facebook page for updates on the next scheduled sale.